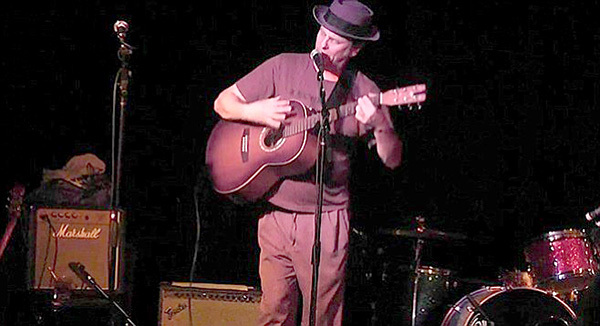 Spacebar in La Mesa hosts a night of casual sing-along music with local musician HappyRon and special guests. Show starts at 6:30 p.m. Free. 7454 University Ave. The Montera senior living center is celebrating Thanksgiving with local friends, partners, and advocates. Join them 4-6:30 p.m. for appetizers, holiday cocktails, and live music. Free. 5740 Lake Murray Blvd. 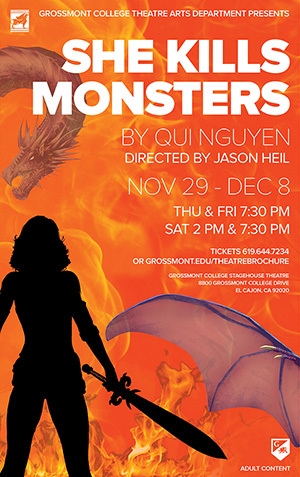 Grossmont College Theater Arts presents a play written by Qui Nguyen about a young woman who stumbles into a world of Dungeons & Dragons in order to search for the identity of her deceased sister, whom she didn’t get a chance to know. “She Kills Monsters,” directed by Jason Heil, is a comic romp into a world filled with fantasy, adventure, romance and more. Nov. 29, 30 and Dec. 1, 6, 7, 8 at 7:30 p.m.; matinees Dec. 1 and 8 at 2 p.m. at Grossmont Stagehouse Theatre, 8800 Grossmont College Drive, El Cajon. For tickets and more information, visit bit.ly/2RjhWWi. The city of La Mesa invites residents out for a night on the town and to the holiday lighting ceremony at Legacy Park. Enjoy live music with a warm mug of coco from the hot chocolate bar while exploring the city’s downtown Village. 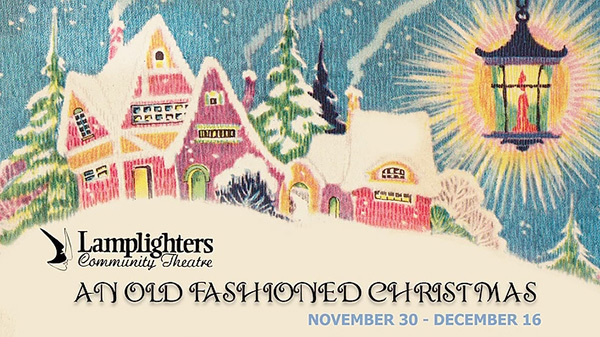 Festivities begin at 5 p.m. with the lighting ceremony at 5:30 p.m.
Join the Lamplighters Community Theatre for a celebration of Christmas set in the mountain town of Julian, California during the 1980s. Residents of the local retirement center long for an old-fashioned Christmas, like those they remember from their childhoods. They gather together to a make that wish come true with hilarious consequences. $15 for adults, $10 for children. 5915 Severin Drive. For show times and tickets, visit bit.ly/2qRZ6cM. Join doctors at the Grossmont Healthcare District as they cover “Do Not Resuscitate” (DNR), Advance Health Care Directive (AHCD), Physician Orders for Life-Sustaining Treatment (POLST), hospice, palliative care, the End of Life Option Act, and voluntary stopping eating and drinking (VSED). This free workshop aims to educate people on the medical options available for end of life services. 10 a.m.-noon. 9001 Wakarusa St. The World Music program has a long and rich history at SDSU. With the increasing importance of cultural awareness and understanding, the world music ensembles offer a meaningful musical opportunity to engage in the artistic, social, and historical contexts of contemporary, non-Western cultures. This free concert focuses on music from the Balkans. Located in the Smith Recital hall from 6-7 p.m. 5500 Campanile Drive. Help the La Mesa Chamber of Commerce collect toys to donate to children with parents in active military service or who are deployed overseas. Bring a new, unwrapped toy to BJ’s Brewhouse in La Mesa, 5:30-7 p.m., and celebrate with bites and two complimentary drinks. Free for chamber members, $10 online for non-members. 5500 Grossmont Center Drive. Register for this event online at bit.ly/2Fxm96M. 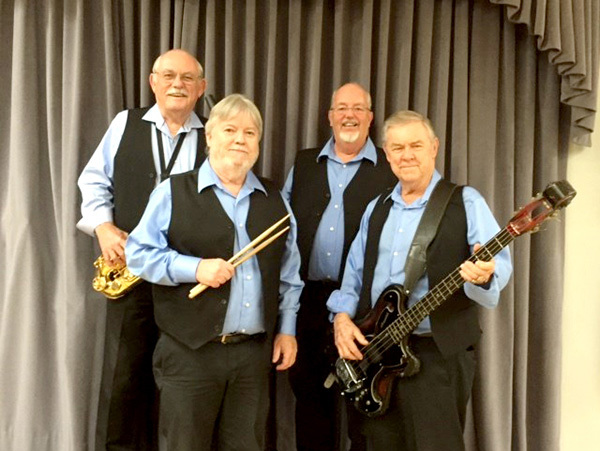 The La Mesa Adult Enrichment Center hosts a night of live music and dancing with local variety band Blue Zone. Show runs from 6-9 p.m. Admission is $5 and includes refreshments. 8450 La Mesa Blvd. La Mesa Holiday in the Village will once again be ringing in holiday cheer for everyone near and far. Friends and family will have the chance to take part in the free, festive fun with live music, cozy fires, dancing, craft vendors, food, and a kids area bigger than Santa’s toy shop. Come by ready to shop, dine, and bask in La Mesa’s joyful atmosphere as this honored tradition transforms the town into a Winter Wonderland for the whole family. To apply to be a vendor or more information, visit lamesavillageassociation.org or reach out to Katie Halvin at 619-458-5966. 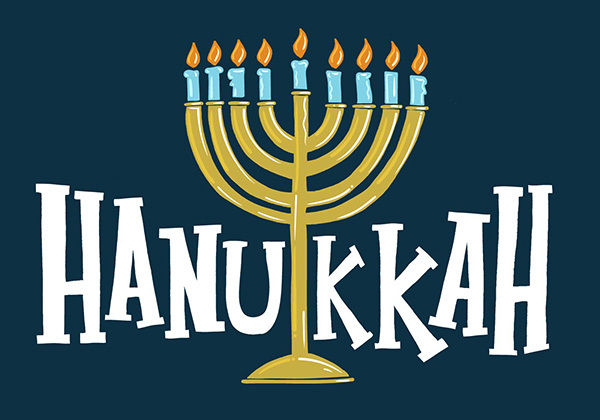 A luncheon will be served at noon, which will include potato latkes and sufganiyot (jelly donuts). A concert and celebration at 12:30 p.m. with Deborah Davis, vocalist and instrumental musicians from of the Second Avenue Klezmer Group. They will play a variety of Yiddish, Hebrew, and traditional Jewish music. Lunch is a suggested donation of $4 for adults aged 60 and over and a fee of $7 for all others. The concert is free. At the College Avenue Center, 6299 Capri Drive. 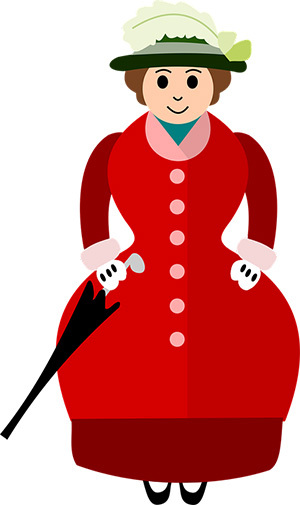 Friends of East County Arts, Inc. is pleased to present A Merry Poppins Holiday Tea on Dec. 8, 11 a.m. at Holy Trinity Parish Hall, 405 Ballard St., El Cajon. Every guest at the “Practically Perfect In Every Way” festive afternoon will be greeted with a glass of Champagne from “Poppins Pub” on arrival, delicious catered lunch, delectable desserts, and live entertainment provided by The Footnotes from Grossmont High School. There will be a “Poppins Mercantile,” where guests can purchase homemade limoncello, delicious cranberry-almond granola, various baked goods, cucumber melon salt scrub, and beautiful Christmas ornaments. Guests will also be able to participate in a silent auction and opportunity drawings. Tickets for the event are $50. Make reservations and pay online at friendsofecarts.org or contact Judy Moore at 619-442-2778 to make your reservations by phone. The La Mesa First United Methodist Church presents a musical telling of the story of Christmas and invites guest to remember the ways the holiday brings people together. The Chancel Choir and the Fiery Spirit Children’s Choir will both perform at this special concert. Show begins at 4 p.m. in the church’s sanctuary. Free. 4690 Palm Ave.
College Avenue Center presents an educational program about the history and foundation of the music form of jazz. This program features guest artist, Rob Thorsen and his trio. This informative and entertaining program will trace the story of jazz music through the years and play exciting music reflecting this diverse genre of music. This program is free. 1 p.m. at the College Avenue Center, 6299 Capri Drive. Have your blood pressure checked by a registered nurse with the Sharp Grossmont Hospital’s senior resource center. A station will be set up at the William C Herrick Community Health Library from 9:30-11 a.m. 9001 Wakarusa St. For more information, call 619-740-4214. 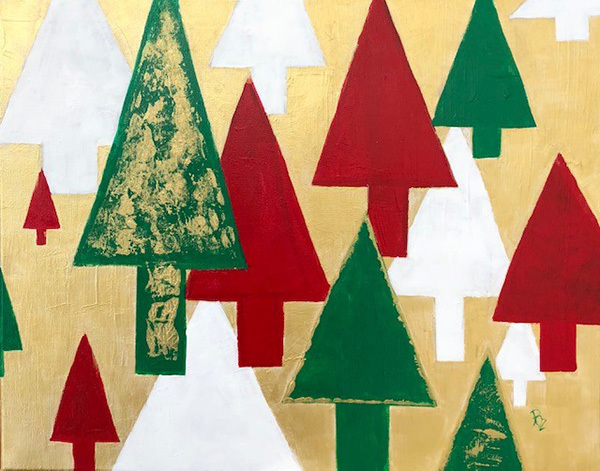 Join Nainsook Framing for a two-and-a-half-hour session where guests will create an 11-by-14-inch acrylic painting of their choice of either Christmas trees or wine bottles. All materials and snacks included. Guests are invited to bring their own wine as well. $35. 6-8:30 p.m. 8130 La Mesa Blvd. 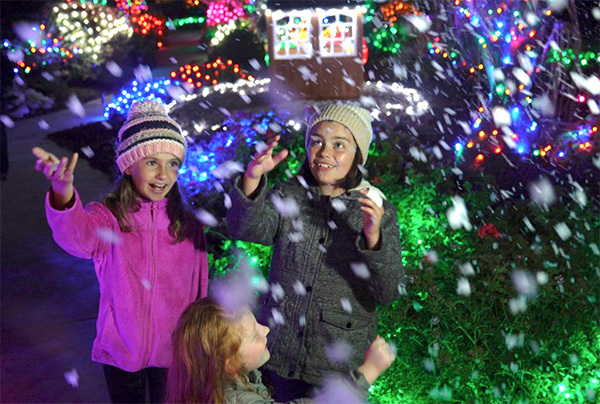 Noah Homes presents an Enchanted Village complete with lit trees, magical cottages, live performers, a snow machine, interactive exhibits and more to entertain guests of all ages. All proceeds benefit adults with developmental disabilities. Friday through Sunday, Dec. 14-16 and Dec. 21-23, 4-8 p.m. at Noah Homes, 1256 Campo Road, Spring Valley. Adult tickets $14.99; children 3-12 $9.99; children 3 and under free. Tickets and information at enchantedvillage.org. The Liberty Theatre in Paradise Village presents an afternoon with the California Note Catchers, a nonprofit women’s a cappella chorus in San Diego. Join them for their Holiday Harmonies concert featuring family-friendly holiday music in the barbershop style. Show starts at 3:30 p.m. $10. 2700 E. 4th St. 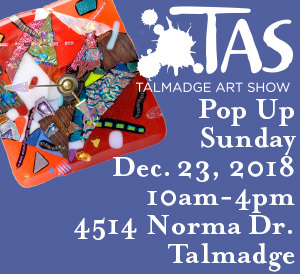 The Holiday Talmadge Art Show Pop Up is Sunday, Dec. 23 10 a.m.-4 p.m. at the Talmadge home where it all started. Twenty local artists will be selling handmade craft including clothing, pottery, all types of jewelry, purses, and more. Two food trucks will also be on location as well. Join in the holiday celebration and find those last-minute gifts. Free. 4514 Norma Drive. Directions, list of artists and more at bit.ly/2Fxv0FE. The La Mesa Adult Enrichment Center shows various films on Thursdays at 1 p.m. in the center’s main hall. Cost is $2 per ticket. 8450 La Mesa Blvd. For movie listings, visit bit.ly/2Ftogsp. La Mesa’s farmers market offers fresh local produce, food, music, and crafts. 3-7 p.m. along La Mesa Boulevard. Free. Visit lamesavillageassociation.org. The Grossmont Center Hosts the StoryTent on Sundays, which invites kids of all ages to pick out a book, read it out loud to a volunteer, and earn cool prizes for reading. Volunteers ask engaging questions to help kids build reading comprehension and critical thinking skills. Free. 5500 Grossmont Center Drive.